Dish and Spoon Productions, LLC, offers the most extensive collection of truly exceptional fine art and accessories for children in the world. Luxury, style, sophistication. Color, whimsy, and imagination. All are descriptors synonymous with the award-winning artistry and distinctive products associated with our brand. 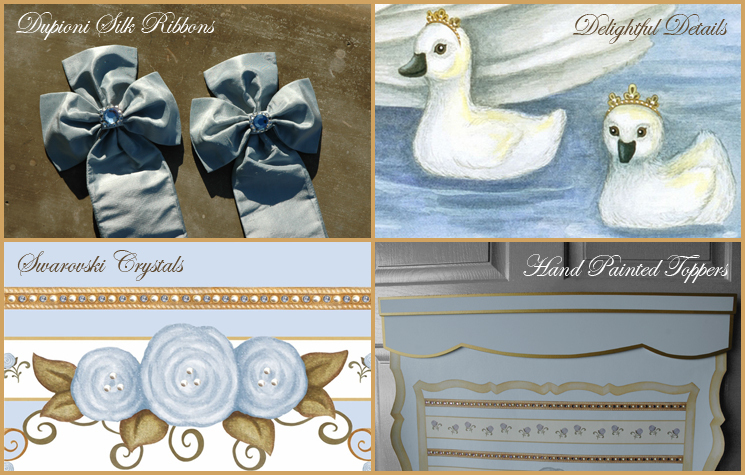 Established as the gold standard in fine children's décor, the company offers a stable of delightfully detailed product lines that encompass more than 2,000 works of art, including canvas wall hangings, name plaques, stretched art, silhouettes, portrait décor, growth charts, signature designs, and regal crowns. Newer product introductions include children's wall clocks and fine furniture. With Dish and Spoon Productions' products, quality is assured and delivered with attention to old-world service and detail rarely found in the marketplace today. All of our products are hand-crafted and custom-made in the USA with top-notch materials and delivered to the customer within 2 to 3 weeks from receipt of order. As a company, Dish and Spoon Productions anticipates trends in the children's décor industry to bring our valued resellers distinctive palettes and innovative designs that combine classic with the unexpected. Enthusiastically embraced by parents and children alike, each of our artful products is tactile, richly detailed, and completely unique. Because we understand the value of creating one-of-a-kind art for children's spaces, we offer the ability to customize all of our artwork and furniture, including our popular custom color matching service and embellishment enhancements, available through affordable a la carte pricing. From our gorgeous Dupioni silk ribbons to our exquisite Swarovski crystal embellishments and hand-painted wooden toppers, thoughtful customization options abound. Personalization is always available and offered free of charge. Sold exclusively to the trade, Dish and Spoon Productions' products are available through the finest children's boutiques, gift shops, and furniture stores worldwide with a market presence in more than 1,000 brick and mortar stores as well as high-end catalogs and websites. If you are a consumer and would like to make a purchase, please contact us to locate a retailer near you. If you are a retailer or interior designer interested in carrying our line, please sign up to become an authorized dealer by filling out the wholesale application on our For the Trade web page. Dish and Spoon Productions takes product safety very seriously. All of our products are compliant with required government guidelines for product safety and labeling as put forth by the Consumer Product Safety Improvement Act (CPSIA). If you have any questions regarding a specific product, please contact us at dishandspoon@comcast.net.